Swedish Grand Prix rider Charlotte Haid-Bondergaard has acquired the 9-year old Hanoverian gelding San Andreas as her 2020 Tokyo Olympic Games' hopeful. The bay gelding has arrived at Charlotte's Norrehee Dressage Stable in Fultofta, Sweden. San Andreas is a 2007 born Hanoverial gelding bred by Hans-Henrich Ottmann and previously owned by Australians Linda and Beau Dowsett from Queensland. He is by Sandro Hit out of Waroness (by Walt Disney I x Bolero x Grande). The horse was first competed as a 3-year old by German based Australian Robert Schmerglatt Harrisson. In 2011 Australian Jayden Brown took over the ride and claimed his stake in the spotlight with the tall, athletic bay gelding in Australia. The duo won the 5-year old young horse classes at the New South Wales Regional Championships held during the CDI Sydney. They also won the Elementary level Championship at the 2012 Australian Nationals. The successful duo then went on to represent Australia at the 2013 World Championships for Young dressage Horses in Verden, Germany, where they finished 3rd in the consolation finals and 14th in the Finals for 6-year old dressage horses. While Brown travelled back down under after Verden, San Andreas stayed in Germany to be prepared for FEI level by trainer Hubertus Hufendiek. He competed the Hanoverian at small tour level in 2014 with victories at the national show in Bielefeld. 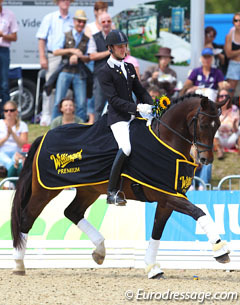 In July 2015 Hufendiek and San Andreas made the leap to Grand Prix level and contested the Intermediaire II at the CDN Heroldsberg in July 2015. 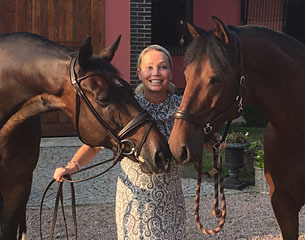 German horse dealer Jochen Arl matched Charlotte Haid-Bondergaard to San Andreas and he believes the new combination has a bright future ahead of them. The rider is equally ecstatic about her acquisition. "San Andreas has high potential in his three basic gaits combined with an amazing rideability," Haid-Bondergaard told Eurodressage. "I was very impressed from the first moment with his potential and character. I will take my time to get to get to know him. He might follow my other horses to the competition in Mallorca as a training horse." Charlotte added that she will most likely compete him first at small tour level before gradually introducing him to Grand Prix showing. "My plan for the future with this horse will hopefully be becoming a team member for Tokyo," she stated cheerfully. In 2013 Haid-Bondergaard had already purchased the now 11-year old French bred Roberto des Frettes (by Carinho des Noes x Boulou des Frettes) through Arl as her rising Grand Prix horse. So far the pair has competed with success at major international Grand Prix shows such as Barcelona, Hamburg, Malmo, Kaposvar, Hamburg and Falsterbo.